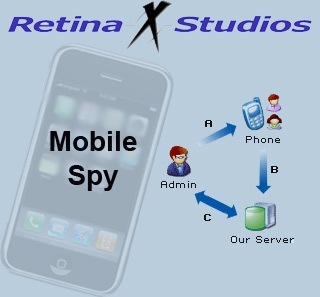 The leading provider of computer monitoring and spy software solutions, Retina-X Studios (RXS) has debuted the new Mobile Spy version 3.0 spy software for Apple iPhone, which allows users to track GPS locations, SMS messages and calls of employees, teen or family mobile phones by logging into SSL secured online control panel from any computer or phone’s web browser. “Mobile Spy is a priceless piece of software. After having some doubts about honesty, this really helped set the record straight and confirmed my suspicions,” said Derrick, a Mobile Spy user. According to the company, the Mobile Spy software which allows users to monitor their handsets in real time is runs completely stealthily (runs in the background behind all other applications). After the spy software is setup on the cellphone, it will silently record SMS messages, GPS locations and call activities, and then upload the data to your private Mobile Spy secure online account. The Mobile Spy version 3.0 software that compatible with all iPhone models, Windows Mobile or Symbian OS based smartphone is priced at $99.97 (1-year subscription).